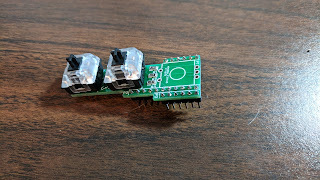 Boards for a two-button EmerKeyB arrived with the simple encoder-only boards. A two-button version was assembled using stocked Cherry switches, but an encoder wasn’t available at the time. No coding has been done for the two-button version, but plans have been set up. The buttons should allow for an easier interface and more functionality. It should be possible to hold certain combinations of the buttons to boot the keyboard into different modes. For example, pressing a particular combination would allow the encoder to be used only as arrow buttons for navigation through boot menus.